Why do so many Chinese Investors Immigrate to the U.S. through EB-5? Home > EB-5 Investment Visa > Why are so many Chinese Investors Immigrating to the US through EB-5? When examining the countries of origin for investors in the EB-5 Program, there is one country that is the clear major player: China. Since 2011, China has made up 82% of the total world market share for EB-5 visas. Since China contributes such a large portion of investors to the program, there is an automatic significance here and it is worth looking into the user cases of why so many Chinese are migrating to the United States. According to Invest in the USA (IIUSA), between 2011 and 2014, the entire EB-5 Program experienced 13,375 I-526 (Immigrant Petition by Alien Entrepreneur) approvals. Of those 13,375 approvals, 11,094 were Chinese investors. China has dominated the market; however, this came with a price in 2014 when China became the only country to hit its per-country EB-5 visa limit. This caused retrogression, which is essentially a backlog that creates longer processing times for investors from Mainland China. Despite retrogression, China continues to be a major player in the EB-5 market. According to a survey done by EB-5 Affiliate Network of about 300 Chinese Investors, the top 3 factors affecting the quality of life in China are the environment (42%), asset tax (12%), and the economic growth slow down (12%). China’s high levels of pollution and poor air quality have a major impact on the quality of life. According to the World Health Organization, PM 2.5 levels above 10 are considered hazardous, as the pollutant can lead to asthma, cardiovascular disease, and cancer. 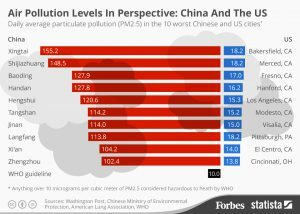 This Forbes article examines the PM 2.5 levels of the 10 cities in China with the highest levels of air pollution alongside the 10 cities in the United States with the highest levels of air pollution. While environmental problems are the primary concern, economic reasons are also very significant. According to the 2015-2016 Billionaire Census, “Asia was responsible for 70% of all new billionaire wealth in 2015” and “Asia leads all regions in growth of both billionaire population and wealth at 15.2% and 19.6% respectively.” Because of the significant growth in the Ultra High Net-Worth community in Asia, it is clear for economic reasons why Chinese individuals would be turned off by high asset taxes and the slowdown of growth for the economy. While the economic growth in the US is slow, the US economy is still far better off than other regions of the globe. For Chinese investors, the US presents the potential for opening new business ventures. A study from the National Foundation for American Policy titled “Immigrants and Billion Dollar Startups” found that 51% (44 out of 87) of the companies in the US that are valued over $1 billion had at least one immigrant founder. Of those 44 immigrant-founded billion dollar startups, they collectively are valued at $168 billion. 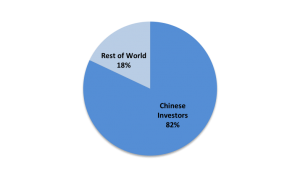 Aside from reasons Chinese investors chose to leave China, the reasons they chose the US as their immigration destination are very much the same as all EB-5 investors. Many EB-5 investors pursue the path to US Green Cards in order to provide the best opportunities for themselves and their families. The US is a very economically and politically stable country that offers the best universities in the world. To learn more about LCR and LCR’s EB-5 projects, contact one of our team members in one of our various offices around the world.